Paneer Bhurji is a delicious juicy dish consisting of crumbled paneer (or farmer's cheese), onions, tomatoes, capsicum along with an aromatic blend of Indian spices. 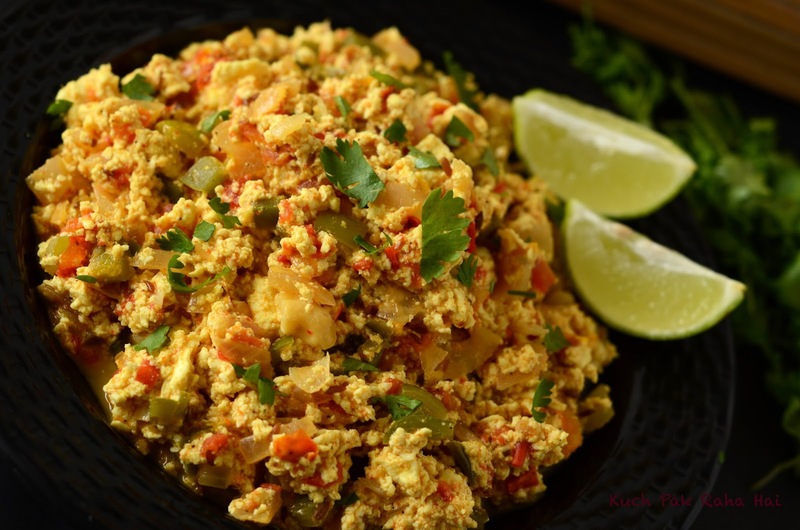 Paneer Bhurji is a wonderful option as an accompaniment or side dish. 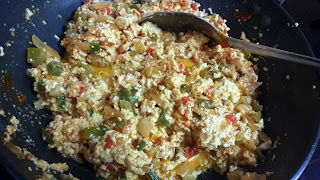 The paneer bhurji recipe I am sharing here can even be used as filling for sandwiches or Kathi Roll. It is a kids friendly recipe as it is not only delicious (with mild spices) but healthy too. You can give it in kid's tiffin with chapati or parathas. Paneer is a rich source of protein, fats, carbohydrates and calcium. Its nutritional value increases manifolds when combined with vegetables and nuts(cashews). 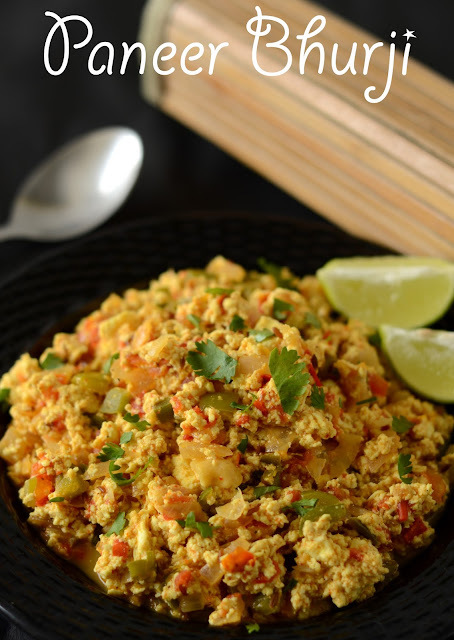 Paneer Bhurji is really easy and quick option to make especially when you don't have enough time or energy to make anything elaborate. I even like to eat the leftover paneer bhurji over my toast in breakfast. The spices in the recipe can be adjusted as per one's taste. You can omit cashews if you are allergic to nuts. Hope you would like this melt in the mouth and delightful Paneer Bhurji recipe!! Heat ghee in a heavy bottomed pan and add cumin seeds. When the seeds begin to crackle, add ginger paste and chopped green chillies. Stir well for 10-15 seconds. 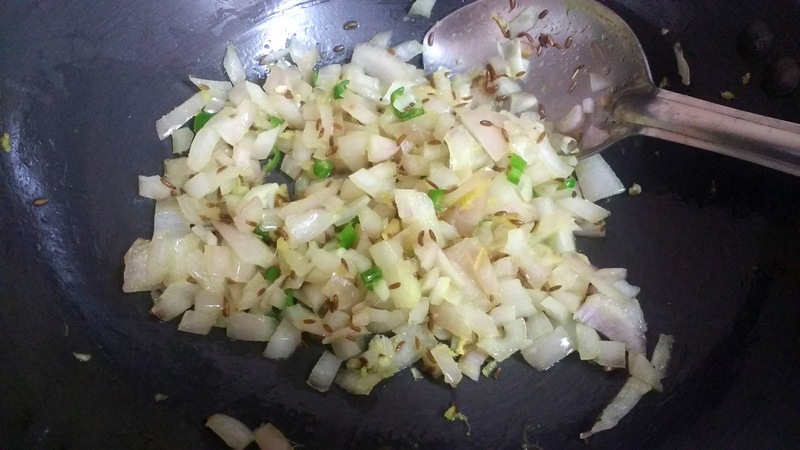 Add chopped onions. Fry the onions till they turn pink in colour. Add chopped cashews and capsicum to it . Stir once again. 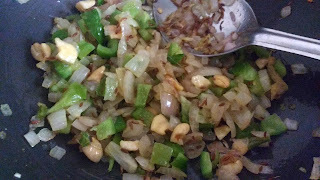 Let the cashews and capsicum sauté for 2-3 minutes. 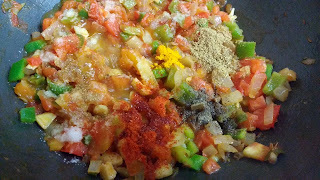 Add chopped tomatoes, salt, red chilli powder, black pepper, turmeric powder and coriander powder. Mix well and let it cook for 10 minutes. Once the all the moisture is evaporated from the pan, add grated cottage cheese along with milk. Mix well all the ingredients and then cover the pan with a lid. Let the bhurji cook for 5 more minutes on low flame. This gives crumbled panner ample of time to absorb milk and spices. Sprinkle some garam masala at the end. At the time of serving, add butter (optional) and freshly squeezed lemon juice. Garnish with chopped coriander leaves. 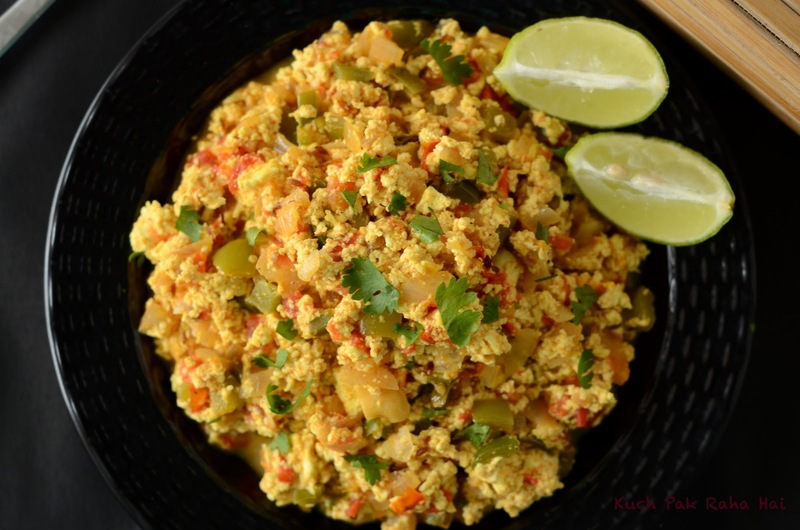 Serve this hot and delicious Paneer Bhurji with chapati or parathas.